Do you know the children’s story, "The Little Red Hen and the Grain of Wheat"? As the story goes, a little red hen finds a grain of wheat, and asks her friends, "Who will plant this wheat?" "Not I," say the cat, the pig, and the turkey, each in turn. "Then I will," says the little red hen. After the wheat grows tall and ripe, she asks, "Who will reap this wheat?" Again, her friends respond: "Not I." "Then I will," says the little red hen. 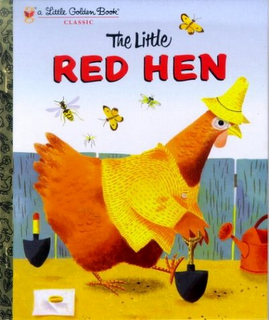 After reaping the wheat, the little red hen asks, "Who will thresh this wheat?" Again, the cat, the pig, and the turkey reply, "Not I." And the little red hen says, "I will, then." And she threshes the wheat. "Who will take this wheat to the mill to have it ground?" she asks next. Again, she hears, "Not I," as each friend replies in turn. So, she takes the wheat to mill and soon returns with flour. "Who will bake this flour?" asks the little red hen. "Not I," says the cat. "Not I," says the pig. "Not I," says the turkey. So, she bakes the flour and makes a beautiful loaf of bread. Finally, the little red hen asks, "Who will eat this bread?" "I will," says the cat. "I will," says the pig. "I will," says the turkey. The story ends with the little red hen responding to her friends, "I will," and she eats up the loaf of bread. This child’s story, reminds us of some Biblical truth about stewardship of our resources (time, money, energy, activity). It would be wrong for us to contribute nothing to kingdom work and expect to reap the benefits. In Luke 6:38 Jesus taught: "Give, and it will be given to you: good measure, pressed down, shaken together, and running over will be put into your bosom. For with the same measure that you use, it will be measured back to you." In 1 Corinthians 12:7 Paul notes, "But the manifestation of the Spirit is given to each one for the profit of all." And in Galatians 6:5 he says, "For each one shall bear his own load." Who will keep the nursery? Who will sing in the choir? Who will find a personal ministry to pursue? Who will be faithful and consistent in Bible study and worship? Who will give tithes and offerings to support the work of ministry? On Commitment Sunday at JPBC, let the church be filled with little red hens who say, "We will!!!" to the glory of God.